I made this delicious chocolate chip recipe last night and wow, are they amazing. 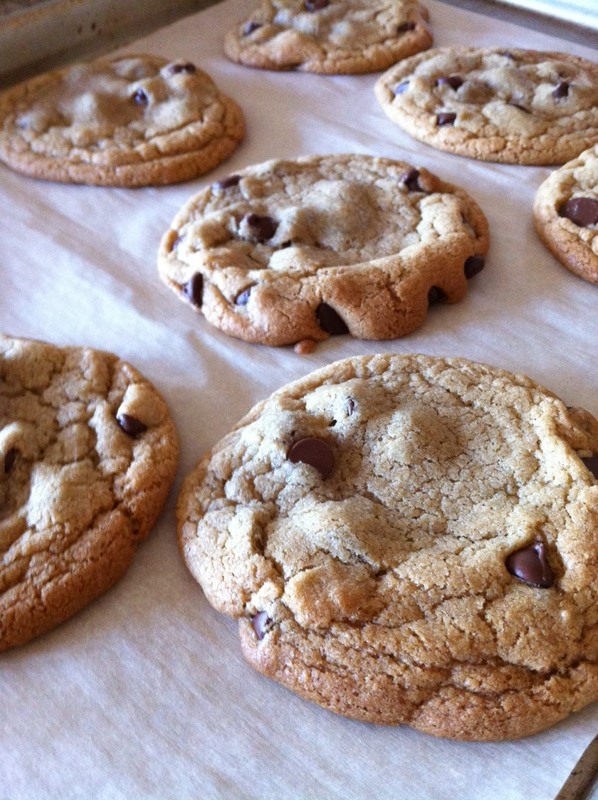 They make giant cookies that are chewy, flavorful and bake to perfection. The only adjustments I made were to bake them for 8 minutes in a convection oven after measuring the dough with a tablespoon instead of a 1/4 cup. And then once they're out of the oven I fan the cookies while they're still on the tray for about 15 seconds (I use my hand while it's still in the oven mitt, that helps) then transfer them immediately to a wire rack. I feel this prevents them from over-cooking, keeping that yummy chewy center. They're so good I had them for breakfast. It's definitely my new favorite go-to cookie recipe. Hope you make these and eat them all up! Recipe after the jump. Hi, I just found your blog, and I really like it. Very cool! Thanks so much Noella & Rocio! Both you girls are so creative, enjoyed browsing your blogs! I was missing 1 ingredient for my regular chocolate chip cookie recipe so I went searching for something new and found yours on pinterest. These were great! I just used extra soft butter (not melted), because I don't like brown edges on my cookie and it worked great. I also just made them regular sized and baked them for 8 minutes. They were perfect! Slight crispness on the outside, still soft and chewy in the middle. I loved the flavor that you get from using more brown sugar. Thanks! I'm a wife, mama to Archer, makeup artist & style seeker. I believe in the power of creativity. I'm a sucker for vintage details and retro beauty. I believe in weekly manicures. Yoga changed my life. I enjoy my daily tea. I ♥ to cook. This is a little place for my thoughts and ideas on home decor, crafts, & food. Stay a while. How pretty are these DIY fixtures? So one-of-a-kind. Decanters , teacups , mason jars , terrariums . Copyright Oh, So Darling 2011. Header Image: My Little Day. Simple theme. Powered by Blogger.